Writing my last post spurred some nostalgia for my teen fanaticism for the band KISS. I've written on this topic before. When the original band reunited and put the makeup back on in the late 90's I wrote a fairly lengthy article for In Pittsburgh about being a fan. I can't find an archive of that article anywhere online and while I'm pretty sure I have a copy it currently resides in some unopened box where I packed it in a move a couple of years ago. 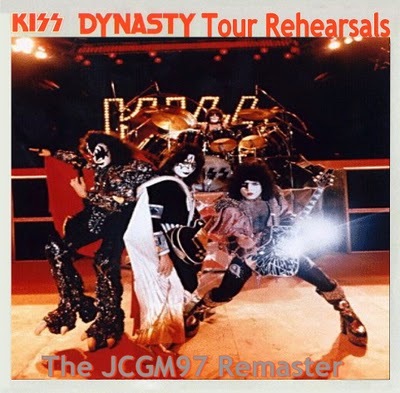 I don't want to rewrite all of that, but I do want to recount some things I discovered about the 1979 Dynasty tour. The night I first met Chiharu (see my last post), June 15, 1979, was the opening night of the tour in Lakeland, Florida. I had seen KISS the year before in Pittsburgh on the Alive II tour (January 13, 1978). In the interim they had released their four solo albums, followed by Dynasty. It was an expensive year to be a KISS fan. Dynasty was met with mixed reviews and reactions from the fans. The single I Was Made For Loving You was widely decried as a sell-out disco song, but for all of the naysayers it ended up being one of their best-selling singles ever. I liked it. For the most part I liked the whole album. After the success of Ace's solo album his songs and voice were more of a presence on Dynasty than on any previous album, which I thought was a good thing. I now know that this time period was the beginning of the end of the original band. Ace and Peter were overindulging in the Rock and Roll lifestyle and having trouble keeping up. Some members of the band weren't speaking to others. At the end of the tour Peter left the band (or was fired, depending on the source you read). On June 15th we didn't know any of this. In public KISS maintained the illusion of being one big happy family. I will say that we all felt that this was the album where we were more aware of the members individually than as a band. The solo albums contributed to that perception. When Dynasty came out I thought of the tracks as “This is a Paul song... Oh, this is an Ace song,) rather than listening to the whole as KISS songs. I now see this as evidence of the fracturing of the band. There was a lot of anticipation leading up to the show. There was going to be an all new stage set. More importantly, they were going to reveal all new costumes. I remember a lot of press and secrecy about this at the time. It was rumored they were adding color to their outfits for the first time, branching out from the straight black and silver we had seen up until then. They had introduced character specific color themes on their solo albums, so we expected this to be part of it. To build mystique and suspense they refused to release pictures of the new costumes before the first show. We were going to see the big reveal. These were the days of Festival seating, which basically meant first come, first serve, no assigned seats. Mark, Scott, Chiharu and I arrived at the Lakeland Civic Center and found some seats. This was Chiharu's first concert and being a fairly small woman she had some understandable concerns about braving the crowd down by the stage. Mark and I were pretty pumped for getting closer than we had been in Pittsburgh. Scott and Chiharu stayed in their seats while Mark and I pushed our way through the mass of people on the floor to a space about ten feet from center stage (yeah, I was smitten by Chiharu, love at first sight and all that... this was a chance to see KISS's new costumes up close. I regret nothing). The opening band was a group called Nantucket and if not for this show I would never have heard of them either. The lights went down. The famous opening line from the show echoed from the speakers; “You wanted the best. You got the best. The hottest band in the world... KISS!! !” Fog rolled out over the crowd, spotlights hit the stage and the four members of the band rose up out of the stage in all of their glory. 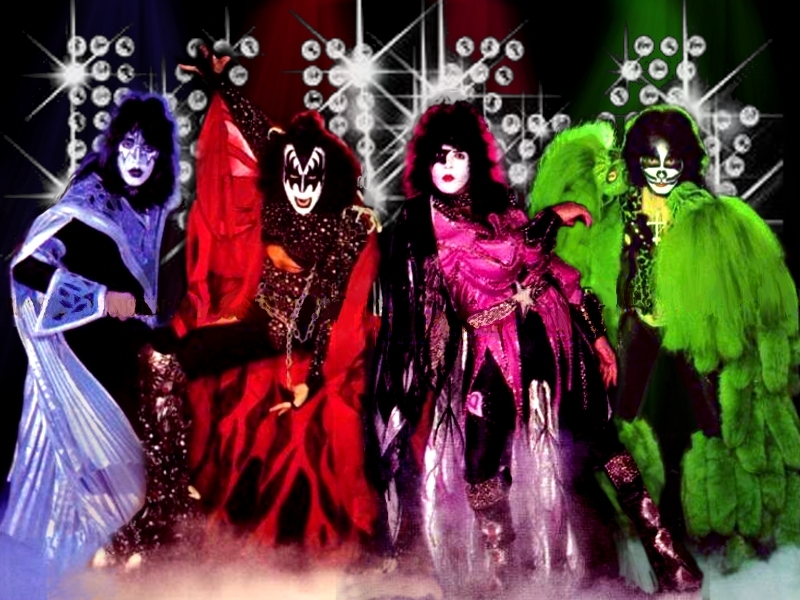 I'm probably in the minority of KISS fans here, but I have to say these are my favorite of their many costumes. They are colorful, ridiculous and completely over the top and that's what I love about them. 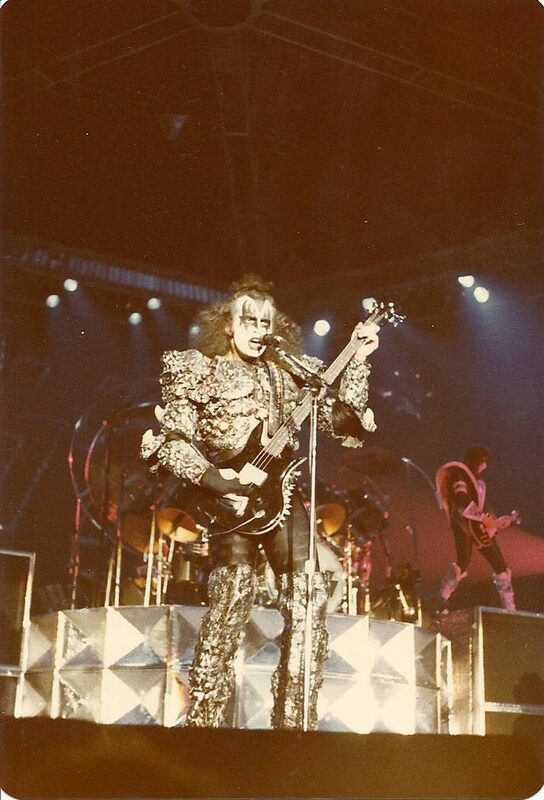 Gene's armor looked like the skin of some giant Godzilla-like monster. Ace was covered in mirrors so that when spotlights hit him it looked like lights were shooting out of his body. 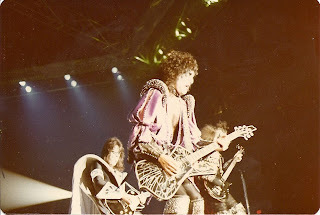 Paul's purple tunic called to mind some fantasy world, the garb of Rock and Roll royalty, the King of the Night Time World (the song they launched into after the lights dimmed again and they took their places on stage). I've known since that night that I was one of the first people in the world to see those costumes, but I discovered a few other firsts from that night I didn't know until a couple of weeks ago. Ace's smoking guitar was already legendary, but this was the first time his guitar levitated into the rafters after his solo. He then shot it down with a rocket from another guitar. This was great, but there was an even more significant addition to the show, a special effect that continues to this day. 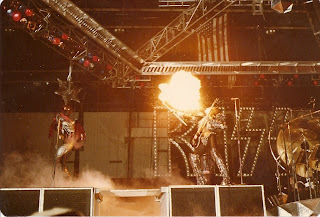 Gene had been doing the blood-spitting and fire-breathing pretty much from the beginning of their career, but this was the first time he flew. We weren't expecting it at all. Gene did his blood-spitting bit and then the lights dimmed. As close as we were we didn't see the stage hands hooking up the cables to his flying rig. Suddenly a spotlight hit Gene and the crowd roared. Then he simply levitated before our eyes, shooting thirty feet straight up to a platform over our heads. Once there he launched into God of Thunder and we kind of lost our minds. I found some pictures online from the Lakeland show. These were credited to Jerry Bennett. Based on his perspective we were about ten to fifteen feet to his right. A little over a month later Scott, Mark and I saw them again in Pittsburgh. It would be the last time until the reunion tour in Pittsburgh in 1996. I discovered that there is a bootleg floating around online of their entire rehearsal for the Lakeland show. This was recorded at the same venue a night or two before. Apparently it has outtakes of the band shouting instructions to the lighting guys and by the end you can hear some of the tension between band members come out. This isn't exactly the concert I attended, but a neat artifact anyway. Radioactive and Tossin' and Turnin' were dropped from the list after a few shows. Let Me Go, Rock 'n' Roll and Christine Sixteen took their places. Magik Market were selling frozen soft drinks in these plastic cups. so I never got the last two. This was probably the height of my KISS fandom. By 1979 I was already starting to move on, echoing the whole of KISS fandom, apparently. I was getting into other music, other bands, other sounds. I had turned onto Cheap Trick and Blondie by this time, and was starting to flirt with some new sounds by bands like The Ramones and The Runaways. I picked up the next couple of KISS albums (and didn't HATE Music From the Elder the way most people did), but I just didn't care as much. By the time the makeup came off on Lick It Up both Peter and Ace were gone and for the most part, so was I. I kept a vague awareness of the band through the 80's but I just wasn't very interested. I wrote my In Pittsburgh article for the reunion show but I honestly didn't plan on going to the show. When they added a second night at the Civic Arena I caved and bought a ticket. It was an amazing recreation of the Alive II era, the first show I ever saw, so I ended up having a lot of fun, fully aware that it was more nostalgia than anything else. I've seen them again in the last couple of years with Eric Singer and Tommy Thayer playing the parts of the Catman and the SpaceAce. I have mixed feelings. They still put on a great show. The spectacle of the concert experience remains pretty true to the original. I've had a great time at both shows and saw some younger fans really enjoying a recreation of something they never had the chance to see. I know a lot of older fans just can't accept the new version. Maybe I've seen comic book superheroes recast with new people under the masks often enough that this doesn't really bother me that much. I miss Peter and Ace but then I miss being eighteen years old as well. Some things can just never be repeated. Do you remember if Ace shot a rocket from a "spacegun" at the other guitar at the guitarsolo? Or did he shoot the rocket with his guitar? I heard he used the "spacegun" in the beginning of the tour. I have no idea who the original photographer was. This is who was credited on the page where I found them (and I don't remember where that was). My apologies if the info is wrong. No problem. I was just correcting. I was 16 and right on the front row. I gave those pictures to Jerry Bennett a few years ago. He is correct. 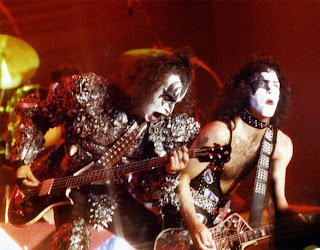 The Kiss pictures from 79 in lLakeand, Fl were taken by John Feazell. I posted some later and credit was given to me. The same ones have been on Youtube for years. You can you tube 67foxcharlie to see them. I only took the ones from the 79 concert and the q105 appearance. Great description, never imagined that something like "the new costumes" something to grow expectations for the public at that time, those we're indeed another times, thanks for sharing!